Adverse drug reactions are a serious health problem, accounting for 3% of revenue and becoming the fourth leading cause of death in the United States. These reactions include allergic reactions caused by specific immunological mechanisms, which are difficult to predict in the clinical practice and could be potentially fatal. Betalactams and from these amoxicillin, are the antibiotics most commonly associated with these allergic reactions probably because they are widely used in the general population. Allergic drug reactions are classified into two main categories in terms of both time interval between taking the drug and the onset of symptoms, and in terms of the clinical manifestations: a) immediate reactions, which develop within one hour after the drug intake, are mediated by specific IgE antibodies and usually manifest as urticaria or anaphylaxis and b) delayed-type hypersensitivity, which occur between 2 and 72 hours after drug administration, are mediated by T lymphocytes and show a cutaneous involvement, such as delayed urticaria, exudative erythema multiforme, maculopapular rash, fixed rash and more severe clinical manifestations, such as Stevens-Johnson syndrome and epidermal necrolysis toxic or Lyell’s disease. Although in the last years more information has been obtained related the molecular mechanisms on drug allergy, they have been mainly obtained on IgE-mediated reactions. For T-cell mediated reaction more studies have been focused on describing the effector or late phase of the process, ignoring the primary phase of the specific immune response, wherein the antigen or hapten contact with the immune system through antigen presenting cells. 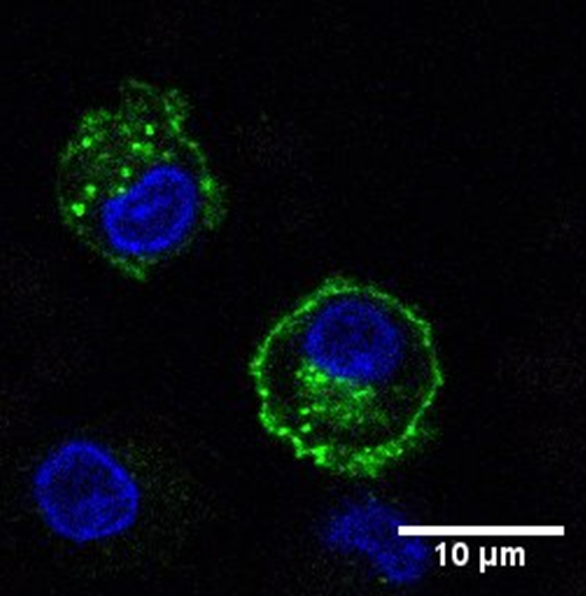 For this primary phase of sensitization, it has traditionally been considered that given that drugs are low weight molecular compounds, to be recognized by the immune system must first bind to proteins either cellular or soluble, thus generating adducts that can be processed and presented by professional immune cells to lymphocytes inducing the immunological response. This first step will determine the type of lymphocyte response, especially when performed by dendritic cells, as serve sentinels and essential in governing from the mechanisms of generation or suppression of tolerance, so that two fundamental premises of the immune system are reached, 1) the distinction between self and foreign molecules, and 2) regulation of the most effective responses to each pathogen causing minimal damage to own tissue. Dendritic cells are the most potent antigen presenting cells of the immune system, in continuous interaction with molecules present in their environment and the only one capable of stimulating naïve T cells and thus initiate primary immune responses. The most interesting feature of the dendritic cells is the key proper of changing its functionality differentially in relation to the different situations found in the tissues. In normal tissue dendritic cells contribute to peripheral tolerance against harmless self molecules and exogenous molecules. This is achieved when in a morphological, phenotypic and functional stage called immature. It is characterized by a high capacity for endocytosis and low surface expression of specific molecules, so that if in such conditions makes contact with specific lymphocytes, it does not provide the proper environment and precise presentation to induce activation and proliferation of lymphocyte clones. Instead, the responses are achieved and are characterized by the induction of immunological tolerance, either by deletion, anergy or tolerance induction. In general, peptides presented in such situations come from the constituent parts of the own tissues, which contributes to the maintenance of peripheral tolerance. As professor Ralph Steinman published “the dendritic cells system is thus designed to harness the recognition repertoire of T cells, consisting of billions of different lymphocytes, each with a distinct but randomly arranged antigen receptor. This repertoire in turn represents a virtually infinite ‘drug library’ for specific therapies that increase or decrease T-cell function”. However, to certain stimuli, the dendritic cell develops into a stage of maturity, which gradually loses the ability to uptake, enhances antigen processing and supports the load of these on MHC molecules, which are conducted to the where stable cell surface, so that the cell has a higher surface density of MHC molecules bound to peptides in immature stages. Furthermore, intracellular molecular mechanisms, leading to the appearance of costimulatory molecules on the cell surface, are activated. This phenomena produce the maturation of dendritic cells and allow them to migrate to secondary lymphoid organs, where they meet with specific lymphocytes. Thus, if mature dendritic cells contact to lymphocytes recognize antigen through their T cell receptor (TcR), a response generated in these leading to their activation and proliferation. The maturation also induces changes in the pattern of cytokines secreted by these cells, which help to generate different type of responses either immediate or delayed. Moreover, it has also described a semimature status for dendritic cells being those in which dendritic cells do not produce proinflammatory cytokines despite the expression of MHC and costimulatory molecules. In this sense, our previous results with amoxicillin drove dendritic cells from allergic patients to a phenotypic and functional semimature status, inducing a T-cell proliferation response. The immune system has developed a number of mechanisms through which only the maturation of dendritic cells located in tissues with potential danger, generally related to infectious agents will be allowed. Then, effector lymphocyte responses will be generated. The signals through which the immune system recognizes potentially dangerous situations are called “danger signals”, which are capable of inducing dendritic cells in the phenotypic and functional changes that characterize maturity stages include soluble factors released in situations of tissue damage own. Also includes pathogen associated molecular patterns (PAMPs), the system recognizes structures than their own and between those found own genetic material of bacteria or viruses (DNA or RNA), protein constituents or secreted by bacteria. These PAMPs are recognized by specific receptors. The binding of these receptors to their ligands induces a cascade of internal signaling through different enzymatic pathways including the MAP kinases (mitogen-activated protein kinase) signaling to finally interact with nuclear proteins, such as nuclear factor kappa B (NF-kB) allowing expression of proteins that cause functional and phenotypic change that characterizes the maturation of dendritic cells. Through these signals the production and release of cytokines that enable the activation and proliferation of lymphocytes with mature dendritic cells interact is induced. Different studies have shown the role of dendritic cells involved in this type of abnormal responses to drugs such as betalactam antibiotics, heparins, sulfamethoxazole and radio contrast media, however, there are no details about the molecular pathways involved during dendritic cells maturation process. Therefore, the present report extends our previous observations by providing further mechanistic information about this process from the study of different signal transduction pathways inducing DC maturation, which is a crucial event for the development of drug allergic reactions. Under these circumstances and irrespective of the mechanisms involved, a betalactam as amoxicillin by itself is able to act as a “danger signal”, leading to the activation of stress-associated signal transduction pathways such as MAP Kinases (MAPK) family (p38 MAPK, JNK and ERK) and NF-kB. The involvement of JNK and NF-kB and to a lesser extent the p38 MAPK, could be the cause of an incomplete DC maturation observed, namely a semimaturation process by amoxicillin in these allergic patients. Thus, our study aims to study the role of dendritic cells in the field of allergies to drugs, as we believe that this knowledge will improve our understanding of why in most individuals the immune system generate a tolerant response to the drug, while in certain individuals wrongful specific lymphocyte response is generated. Betalactam antibiotics affect human dendritic cells maturation through MAPK/NF-kB systems. Role in allergic reactions to drugs. Lopez S, Gomez E, Torres MJ, Pozo D, Fernandez TD, Ariza A, Sanz ML, Blanca M, Mayorga C.